I would like to enter this card for the October clarity challenge 'stencils'. I used the 'Stone Wall' stencil for the panel and the background to the sentiment. First I inked through the stencil with stream ink and then turned the stencil and inked through again. I used a black pro-marker to edge it to give some definition. 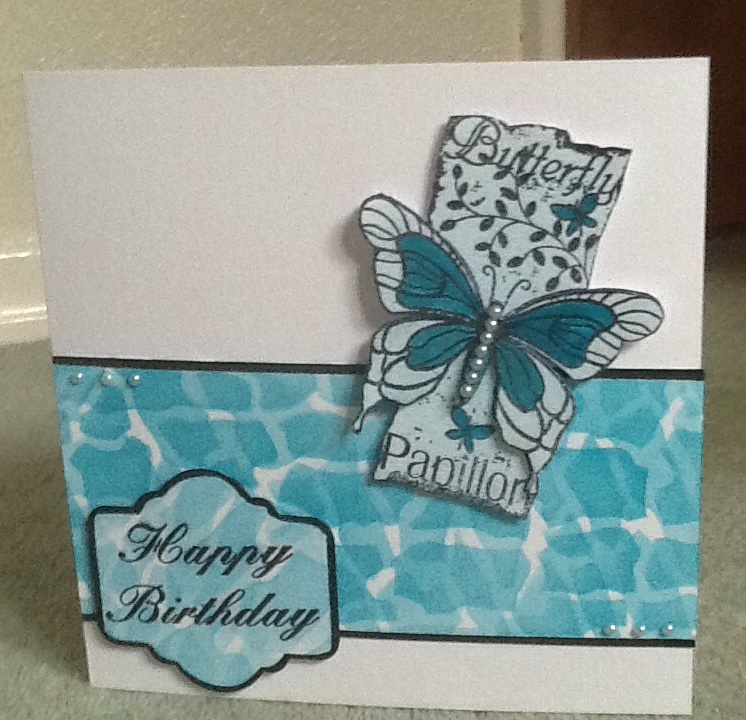 For the butterfly panel I used the 'Butterfly montage' stamp. I cut out the panel part and inked lightly with stream. I then stamped it again and cut out just the butterfly, inked it in the same way and layered it with foam pads onto the butterfly panel. I stamped the sentiment and die cut the shape using a pro-marker to outline it. So very pretty, using the two colours in the offset stencil background adds to it. Thanks for entering the Clarity Challenge and good luck.